Many of today’s vehicles calculate service intervals for you, using dozens of sensors to take in your driving data and calculate the exact amount of service and regularity required to keep your vehicle safe and sound. But seemingly smaller issues are not monitored with systems like that and can cause major headaches in the cold if left unchecked. Most people agree a routine checkup heading into winter before the temperatures really drop is a wise move. You can have your winter tires installed and during that visit, get a peace-of-mind “once over” so you can rest assured winter won’t get you down. “Regular, routine maintenance can help improve your gasoline mileage, reduce pollution, and catch minor problems before they become big headaches,” says Tony Molla, vice president of communications at ASE. First and foremost, read your owner’s manual and follow the manufacturer’s recommended service schedules. Winter visibility can test the effectiveness of your vehicle’s lights, so don’t take chances; check all lights and replace burnt out bulbs immediately. Clouded lenses can compromise headlight performance dramatically, but replacement is not always required. Many can be refinished by many service outlets or by using a DIY kit found in major auto parts outlets. Replace your wiper blades and stock up on winter washer fluid. Don’t forget to always carry a quality ice scraper that can reach all the way across your vehicle. Do NOT attempt to drive with snow and ice piled on top of your vehicle. Poor visibility is not only a danger to you, but to everyone around you as well. Take your time and thoroughly clean off your vehicle before you drive. Have your battery checked. The only accurate way to detect a weak battery is with professional equipment. If you do decide to service your battery yourself, always wear eye protection and protective rubber gloves. Be aware: Removal of cables can cause damage or loss of data/codes on some newer vehicles, so having a pro do it is likely a better idea. 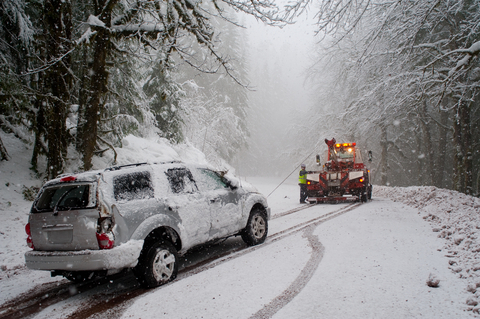 Worn tires are many times more dangerous in winter weather. Have your tires examined for remaining tread life, uneven wearing, and cupping; check the sidewalls for cuts and nicks or anything that may be stuck in them. Check tire pressure once a month and don’t forget to check your spare. Also, be sure the jack is in good working condition and more importantly that you know how to use it! Finally, always carry an emergency kit with you: extra gloves, boots and blankets; flares; a small shovel and sand or kitty litter; tire chains; a flashlight and extra batteries; and a cell phone and extra car charger. Put a few “high-energy” snacks in your glove box too in case you have to wait for help to come. So be prepared and call today to arrange a pre-winter inspection.